In just 48 hours, the Chinese watch company Tianjin Sea-Gull Corp prevailed in an intellectual property dispute last month in Basel, Switzerland, where it was taking part in an annual international watch and jewelry fair. Organizers of the 39th BaselWorld Watch and Jewelry Show received a complaint on March 29 from Swiss jewelry maker TF Est. 1968 that claimed Sea-Gull had copied its design for steel Tourbillon cuff buttons. TF requested the Chinese exhibitor remove its cuff buttons from the exhibition and face punishment. Invented by the French-Swiss watchmaker Abraham-Louis Breguet more than two centuries ago, the Tourbillon uses a rotating cage intended to improve accuracy by countering the effects of gravity. Today it is used more for appearances as a display of watchmaking virtuosity. Tourbillon cuff buttons have the device embedded in them as ornaments. Ma Guangli, chief engineer of Sea-Gull, received a telephone call from Basel about the complaint on the afternoon of March 29 at the company's Tianjin headquarters. But he said he was not worried because he "has full confidence in the patents and intellectual property rights of every Sea-Gull product". In less than 20 minutes, Ma sent all patent certificates and related materials to his colleagues in Switzerland by e-mail. The materials showed the design of Sea-Gull Tourbillon cliff buttons was patented in Switzerland in 2009. It was registered in China in the following year. Sea-Gull filed a counterclaim with the show's intellectual property rights commission on the next day, and won the dispute on March 31. The commission ruled that the Swiss company was in violation of Sea-Gull's intellectual property rights and requested they remove their products from the show. "Tourbillon cuff buttons are our company's competitive products," said Sea-Gull's General Manager Lu Jun. "We applied for patent so as to protect our interests." "There are not as many kinds of ornaments for men as for women," said Ma. "But men's ornaments are generally elaborately made and expensive." "Take the cuff buttons for example, the materials do not cost much, but taking the intellectual property into account, they are worth quite a lot," he said. The price of a pair is about 2,400 yuan ($367) in China, and in Europe more than 200 euros ($285). This is not Sea-Gull's first triumph in a patent dispute. At the same watch and jewelry fair three years ago, well-known Swiss watchmaker Greubel Forsey filed a complaint against the Chinese company claiming it copied the design of Greubel's double Tourbillon watches. Sea-Gull responded with patent certificates and design blueprints to prove it developed the product. Watch and clock experts concluded that although the double Tourbillon mechanisms used in Sea-Gull and Greubel Forsey watches were mostly the same, differences existed in some essential parts, which meant Sea-Gull had not violated Greubel's patent. "As more Chinese companies are involved in the global market, more complaints come out against them," said Liu Jixiang, director of the intellectual property right commission of Tianjin Bar Association. 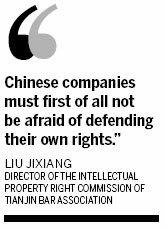 "Chinese companies must first of all not be afraid of defending their own rights," he said. "Then they must improve their capability of innovation." He also suggested that companies taking part in exhibitions get all materials and certificates ready and "make a Plan B in case of getting involved in such intellectual property right disputes".